To begin, for all the crap (to be nice about it) GoAnimators get for animating with pre-made and pre-animated content, in the 3D animation community it's just a generally accepted practice to use other people's models, props sets etc. and no one ever calls them out on it (well I did once to a 3D illustrator and he got hugely upset about the thought of having to credit someone else for the models he was using in his illustrations). Sure there are people making original models but a great percentage of animators use existing models that they customize as necessary to suit their projects. Which is what I intend to do for my Bat Storm, iClone project once I get to it. 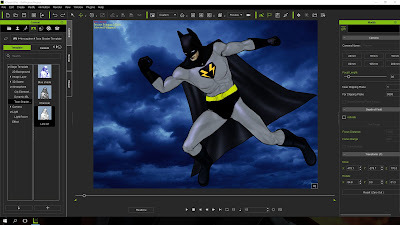 To begin on my image, I purchased an existing Batman character model created by Channel Cat and created my Bat Storm Chest logo in Photo Plus. 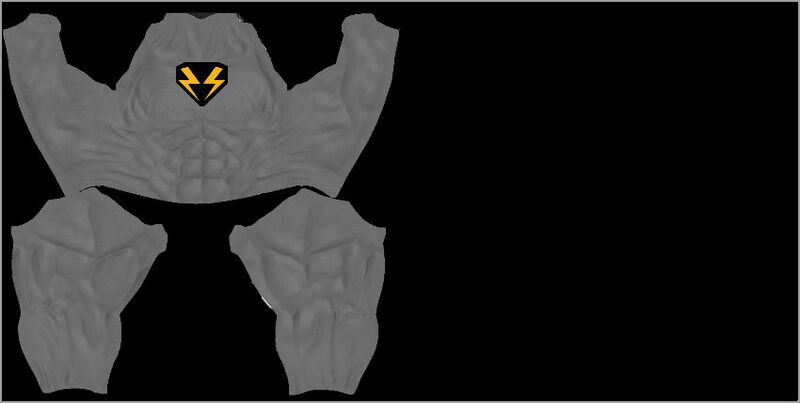 To save time I simply looked for a similar lightening logo and adapted it to my needs (see image above). 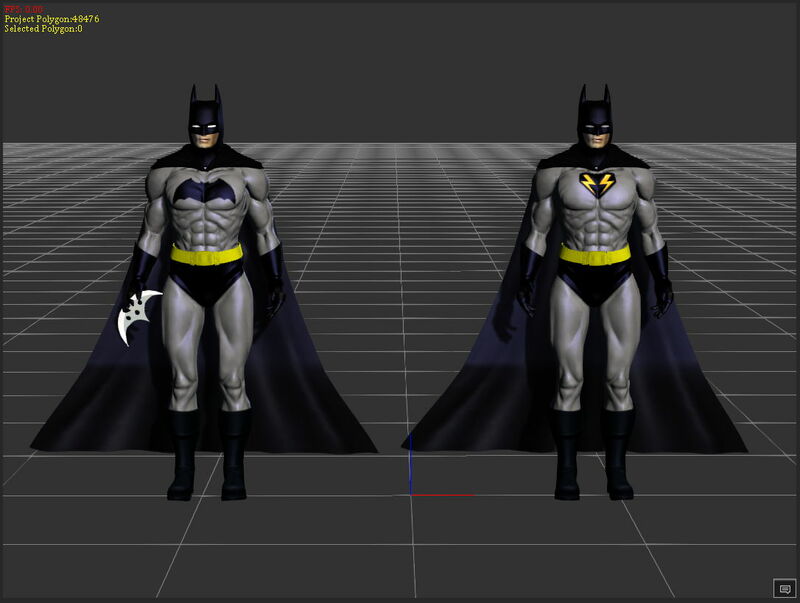 Below you can see the original Batman model on the left and my version with the Bat Storm logo on the right. The only other modification I made was to make the eyes a little less white so they didn't seem to glow as much. 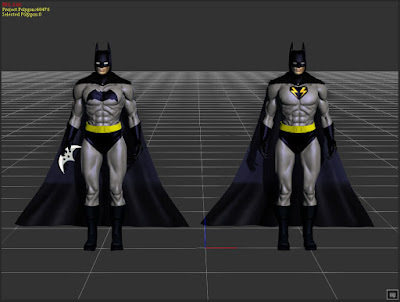 The great thing about iClone is that it's very easy to modify textures on models. You simply locate the texture you want to change, click the button that launches your preferred graphic editor, and make whatever changes you like. As soon as you save your changes the modified texture is saved with the current version of the model. Below you can see the shirt texture with Bat Storm logo as it looks in my graphic editor. Once the model is complete the next stage is to strike a pose. 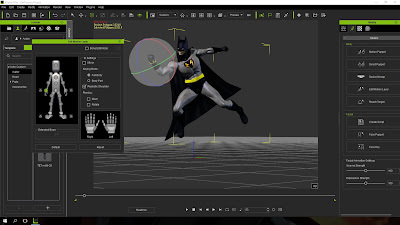 This you can do by dragging any number of action animations onto the character and then selecting a key frame from the animated sequence, or you can adjust every limb manually yourself using the Edit Motion Layer Dialogue box. using the Edit Motion Layer Dialogue box. Once you have your pose, use the camera to get the best dramatic angle. Next add a background. I chose a nice, cool storm cloud background that was already in my iClone content library. Then it's a simple double click to add the ToonShader effect for that cartoon look. double click of the mouse. Finally I used Draw Plus to create the wording and placed that onto the final image that was exported from iClone. The final image you've already seen at the top of this article. Regular readers of this blog will know about my Batman parody character, Bat Storm. Click this link to see past articles and animations if you're not familiar with him. For me the character is just a fun side project that lets me indulge in my Superhero fandom through parody. iClone is ideal for that because I don't have to spend months on character and set design - much like GoAnimate. I can simply focus on the story and animation. 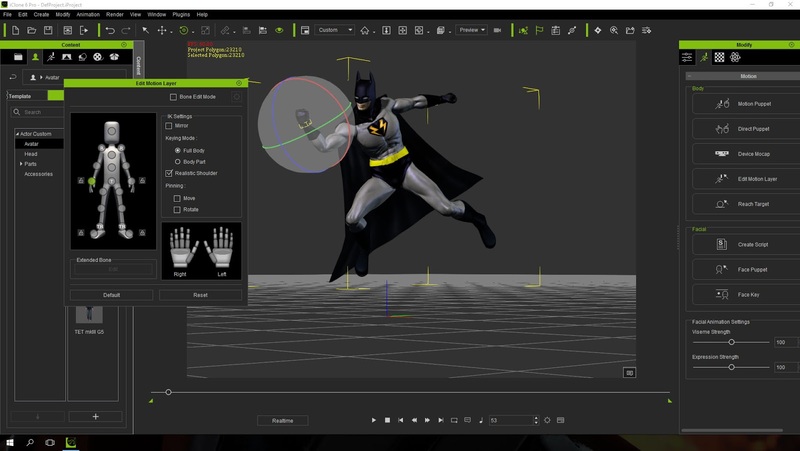 Where GoAnimate limited me some what to pre animated movements, iClone doesn't. 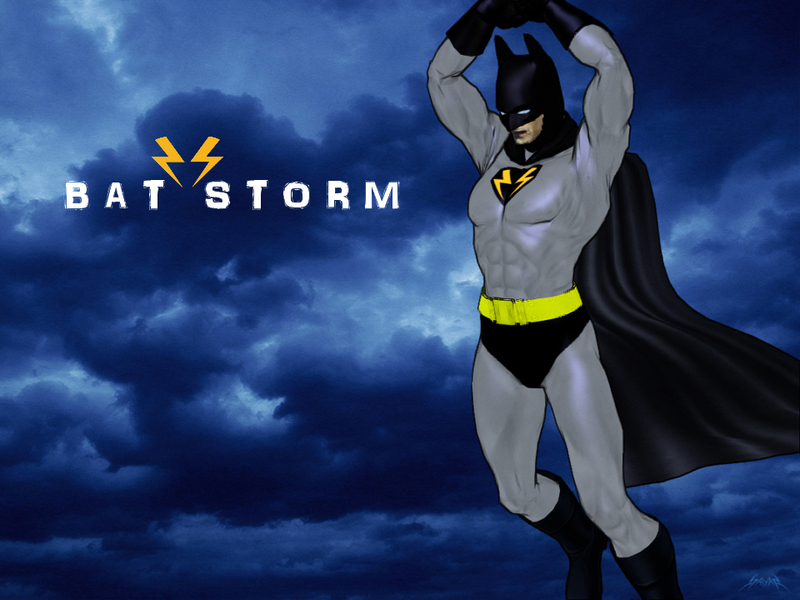 Once I get started Bat Storm will be able to do anything that I can imagine. IClone looks so cool! I have to get this program. This is the software I bought my new desktop computer system specifically for. They've made a patch so it'll run on lower spec machines but at the expense of not being able to run some of the high end features. I'm pretty sure you can trial it for free.